Shopkit is a best design with 4+ pre-made home page.It is a simple and clean layout with elegant design, very easy to install and to use. No HTML knowledge requries, easy to install and easy to use.Themes comes with 4+ layout variations with responsive and fixed layouts.It has been built with mobile users in mind. So it looks great on desktops, tablets and mobiles.Shopkit is an awesome,robust and flexible theme with a design and all fearture of online category and fully custiinuzed,suitable for E-commerece website. It is a dedicated to Jewellery,Cosmetic,Home appliances,Bag,Organic,Resturant,Watch,Fashion,Ceramic,Flower,Shoes,Power-Tool,Pet-Store.Shopkit theme look very good with its pre-made 4+ layout and its image and color combination.Just upload and enable the theme and module, that s all. 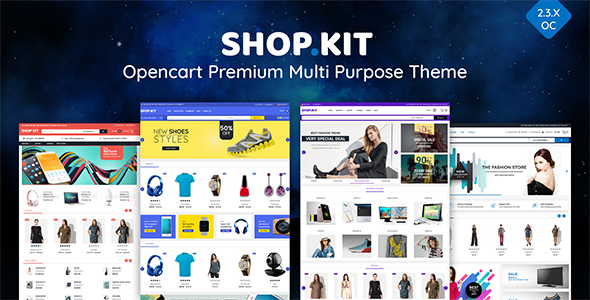 Hope you will have a fresh experience with Shopkit Multipurpose Opencart Theme!